PayPal is one of the most popular ways to sell/buy things online, in this article we take a deep look how it works in Laravel framework. In this case we will also run php artisan make:auth to have a little better visual theme. Next, for this tutorial we will be using a package called Laravel-Paypal which has great reputation from the community and is totally recommended, to avoid reinventing the wheel. php artisan vendor:publish --provider "Srmklive\PayPal\Providers\PayPalServiceProvider"
For this you need to go to https://developer.paypal.com/ and login to your dashboard. Click on the sandbox > accounts in the menu. Create new business and buyer accounts, so we could “play” in our PayPal’s sandbox. Click on your business user and go to profile, then open API credentials tab. Next let’s create a new Invoice model with its migration, so we have a place to store our payment information. Ok, we’re done with the database layer, now let’s move to visual things. After creating routes and views we should make a Controller, to handle all of our payment logic. First thing our controller needs is a constructor method, so we can use our laravel-paypal package. Next we need our expressCheckout method, that will redirect user to PayPal, so he can approve the payment. At this point we should take a look at the $this->getCart() method to find out what information PayPal wants from us in order to make a payment. Important: The return URL of recurring payment has a parameter recurring=1, we need this parameter later, to create a recurring payment profile. The total is calculated by multiplying each item quantity by it’s price and then adding them up. So in our case it should be (10 * 1) + (5 * 2) = 20. Note: If cart total is miscalculated, PayPal will redirect you back with an error, and the payment will not be processed. Now that we got the cart figured out we can proceed to the expressCheckoutSuccess() method. 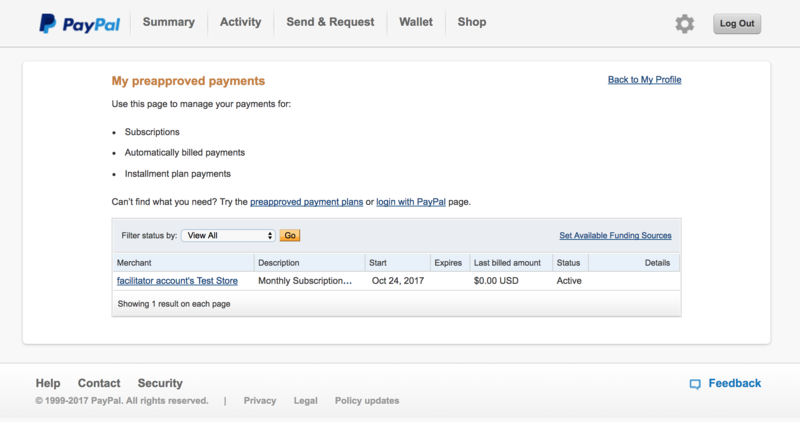 This method is executed when user confirms the payment in PayPal and is returned to our application. Ok, so this method may look big, but it’s quite simple. 2. Check if payment was successful. 3. Then we check if payment was recurring or not? Note: This parameter is not added by PayPal. We set this parameter in our cart’s return_url as recurring=1 if the payment was recurring. So if our payment was recurring, we need to create a subscription profile for the user, so he doesn’t need to pay us manually. 4. Otherwise jus process the payment. 5. Lastly we update our invoice and redirect the user to the home page. At this point you should be able to make your first test payment, yay! Just go to your applications home page and click one of the buttons we created. You should be redirected to PayPal. Important: for sandbox, here you should use the buyer account we created earlier. Hit Agree and continue, and you should be redirected back to your application with a success message. 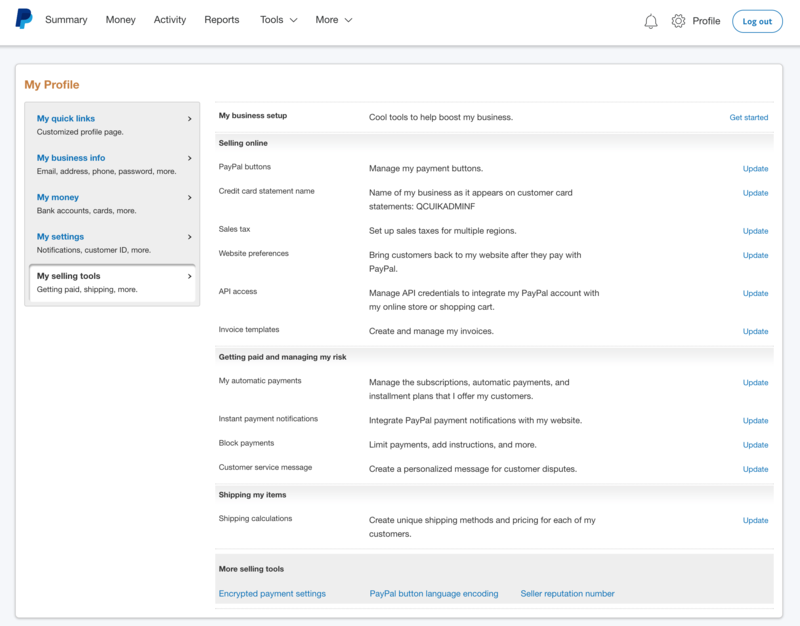 If you made a recurring payment, you can check your buyer account in PayPal’s sandbox to see if recurring profile was created. Just go to settings > payments > manage pre-approved payments and you should see the active subscription. 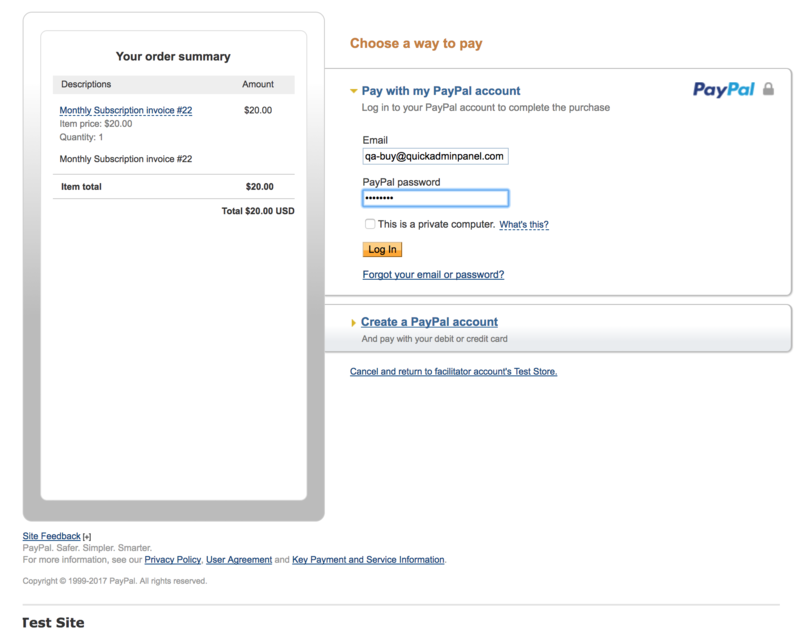 Note: you can also login to your business account in PayPal’s sandbox. For the last part of this demo we need to handle PayPal’s IPNs (Instant Payment Notification) that will be sent to our application every payment cycle after subscription. Only thing left to do is to go to PayPal’s sandbox then login to your business account that we created in the beginning of this tutorial go to Settings > My selling tools. Go to Instant payment notifications, then enter your application URL and check “Receive IPN messages (Enabled)”. Save the settings and PayPal will send you recurring payment notifications. One interesting thing about PayPal is that you can test IPN’s in your developers console but can’t test recurring payments! So if we want to test them, we need to make some mocks of recurring payments that will hit our notify route. Create a new file resources/views/test.blade.php and add some forms for testing. Now just go to your applications /test route and there will be all possible recurring payment calls available for your testing purposes. So, that’s it! That was an overview of how you can use PayPal inside of Laravel. Was it helpful? 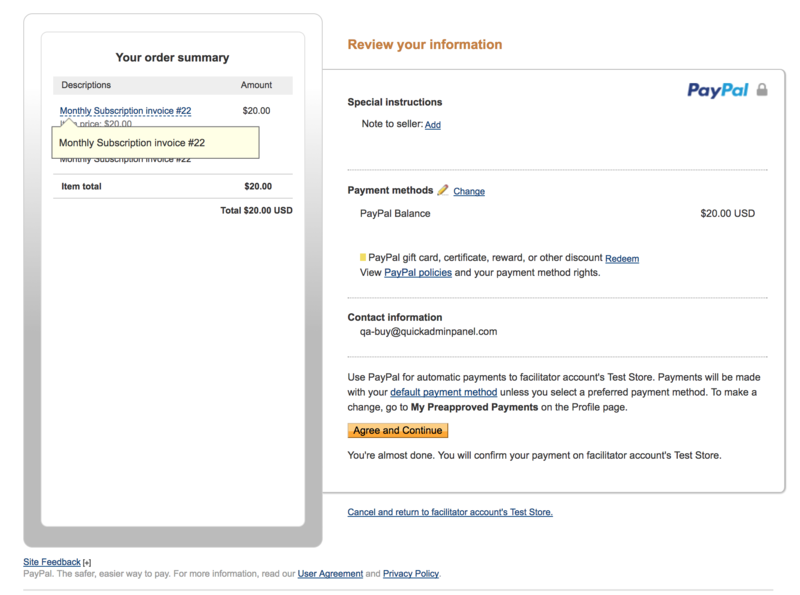 Currency is not supported by PayPal. I try use USD. It is currency for default and it not work. 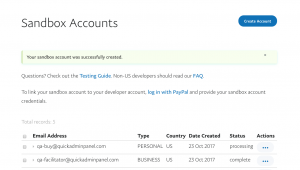 Checkout PayPals documentation “Address Type Fields” you should find address fields you need there, and for taxes you can look at “Payment Details Type Fields” and “Payment Details Item Type Fields”. Probably PayPal changed something in their error reporting, and there’s no L_LONGMESSAGE0 index. I’ve changed the article with common error, but you should check/dump the actual $response variable for the actual error. Hi, does this work with users paying without creating paypal account? Not sure, we didn’t test it with this case. Feel free to try it out. How Should we get next month’s data of recurring payment after first month ? Hi is there a tutorial for negative testing? In this recurring system automatically reduct money from user’s account? both gives same error. with no message. so this is meaning less. fake packege!!!! Don’t blame the article or package if PayPal changed something in their API, they do that really often. Please see the date when article was written. How do I cancel automatic payments ? I tried to replace recurring_id in “cancel profile form”‘ to an id which I have already stored in my db as automatic payment, but I cannot see any difference. How do I test it, if its really turned off the automatic payment every month ? Thanks !